This is just a brief list of facts you should know about diabetes, from the World Health Organisation. About 347 million people worldwide have diabetes. This epidemic is due to lifestyle changes including less physical activity, leading to obesity. Diabetes is predicted to become the 7th leading cause of death worldwide by 2030. The two types of diabetes differ. Type 1 diabetes is due to the body not producing (enough) insulin to deal with dietary sugars. Type 2 diabetes comes from the body's ineffective use of insulin. A third type of diabetes is gestational, raised blood sugar levels during pregnancy. This can cause complications during pregnancy and delivery, and increases the mother’s risk of later developing Type 2 diabetes. About 90% of all diabetes is Type 2. Childhood Type 2 diabetes is increasing. From 50-80% of people with diabetes die of cardiovascular disease. In 2012, diabetes caused 1.5 million deaths worldwide. 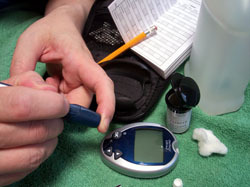 In developing countries, most people with diabetes are between 35 and 64. Complications from diabetes make it the leading cause of blindness, amputation, and kidney failure. Type 2 diabetes can be prevented by eating a healthy diet and exercising at moderate intensity 30 minutes on most days.